In this guide, we will walk you through the basic installation process of WordPress on a Debian 9 VPS with Nginx, MariaDB and PHP 7.1. WordPress is the most popular CMS in the world with unlimited customization options. This should work on other Linux VPS systems as well but was tested and written for Debian 9. 1. Update the system and install necessary packages. Next, we need to create a database for our WordPress instance. PHP 7.1 is not available via the default Debian repositories, so we will add the “packages.sury.org/php” repository, update the system and install the PHP 7.1 packages. PHP-FPM process manager has three choices: Static, Dynamic and Ondemand. The default setting for the process manager is “dynamic”, we will change it to “ondemand”. Finally, run the WordPress installation script by accessing the URL in your web browser of choice. http://example.com/, enter the details for the database we created earlier in this post and create your WordPress admin user. 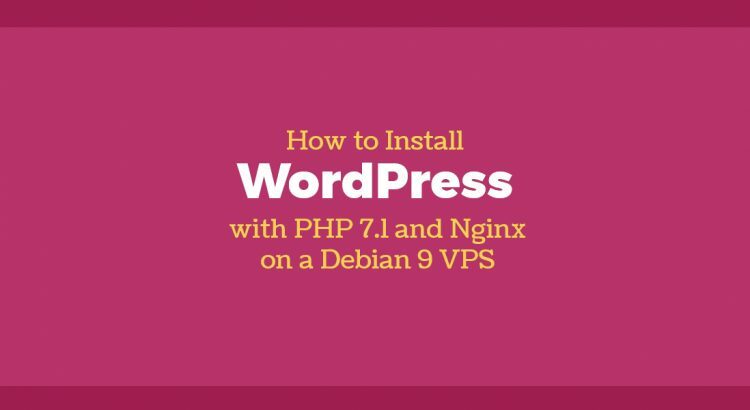 Of course, you don’t have to Install WordPress with PHP 7.1 and Nginx on Debian 9 if you use one of our WordPress Maintenance Services, in which case you can simply ask our expert Linux admins to Install WordPress with PHP 7.1 and Nginx on Debian 9 for you. They are available 24×7 and will take care of your request immediately. PS. If you liked this post, on How to Install WordPress with PHP 7.1 and Nginx on Debian 9, please share it with your friends on the social networks using the buttons on the left or simply leave a reply below. Thanks. Thanks for an excellent tutorial. Followed it and WordPress was installed flawlessly. There are other tutorials on web but I found it to be the best one if someone installs PHP7 on Debian 9. Just 1 simple issue: The server of packages.sury.org is extremely slow. When I installed PHP, data transfer was at I think just 30-40kbps. But it got installed in a few minutes. Thanks for describing all the steps. Hello please keep in mind that nginx has a default server configuration that is serving php-files by default! Else someone could download *.php files (eg. configuration files) by using your ip-address as url!